As promised, the day was very early indeed. Dan and I did manage to get about 4-4.5 hours sleep before our alarm when off at 1 am. At 1:30, we met our group in the lobby and boarded the bus back to the airport ( sometimes I wonder if we wouldn’t have just been better off staying at the airport…but then we would have missed the lovely stroll through the square one last time!). As you can imagine there was very little traffic on the road, so our travel time was only about 35 minutes! 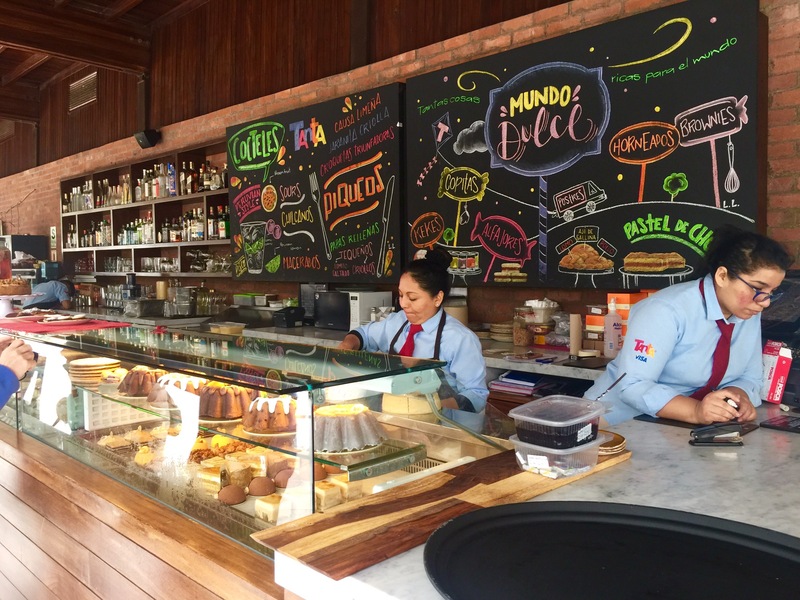 We found the LATAM counter, and got ourselves checked in. Another 1 – 1.5 hour wait for our boarding. Apparently the Quito airport has won the “Best Airport in SOuth America” award, and I can see why. From a passenger perspective the terminal is new, well laid out and very comfortable waiting areas. And when we arrived both from Houston on Day 1, and from Quayaquil on Day 11 our bags were off very quickly making our trip very efficient. At 3:45am , we began boarding for our flight to Lima. This was a relatively short 2 1/4 hour flight that had us in the outskirts of the city at 6:30. 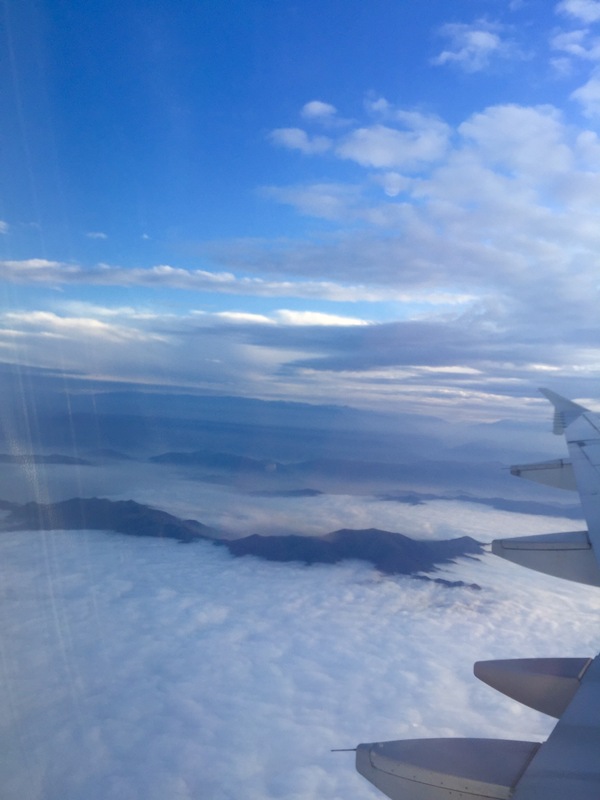 As we were on our final approach you could see the Andes poking above the clouds…the closer peaks looking like islands in the clouds…just amazing! Look into the distant and you can see the tallest of the range in the background. The ten of us got our bags, found our guide and left for the private bus to take us into the city, As promised, Lima traffics is a nightmare! The trip took us bout an hour and a half, the driver drove the full size bus through the streets as if it was a Volkswagen Beetle and was on his phone at least half of the time! Despite our fears, he got us to our hotel safe and sound around 8:30 – 9:00 am. But, of course, our rooms would not be ready until noon at least. So, out we went to explore the city..but first to find a cafe for some breakfast! After we had all had our fill we ventured to the coast to stroll the beach front. 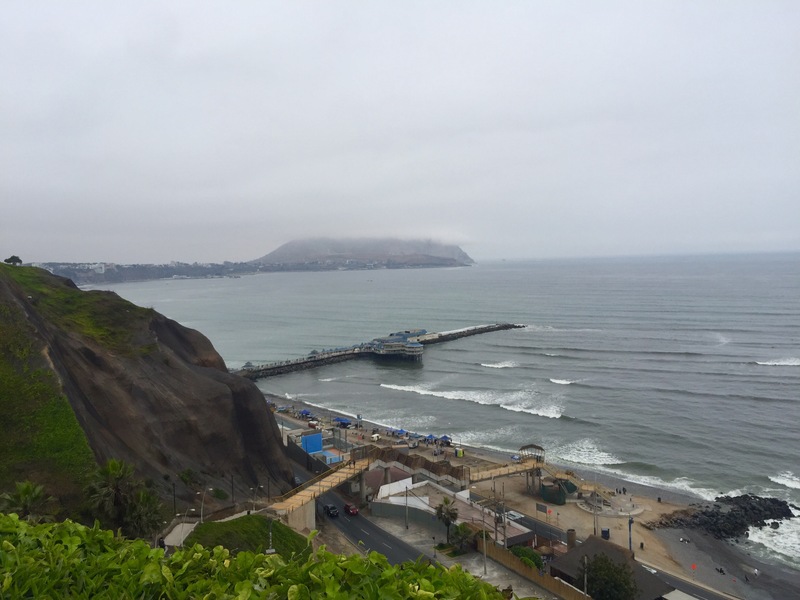 The views of the beached of Lima are spectacular from this walk. 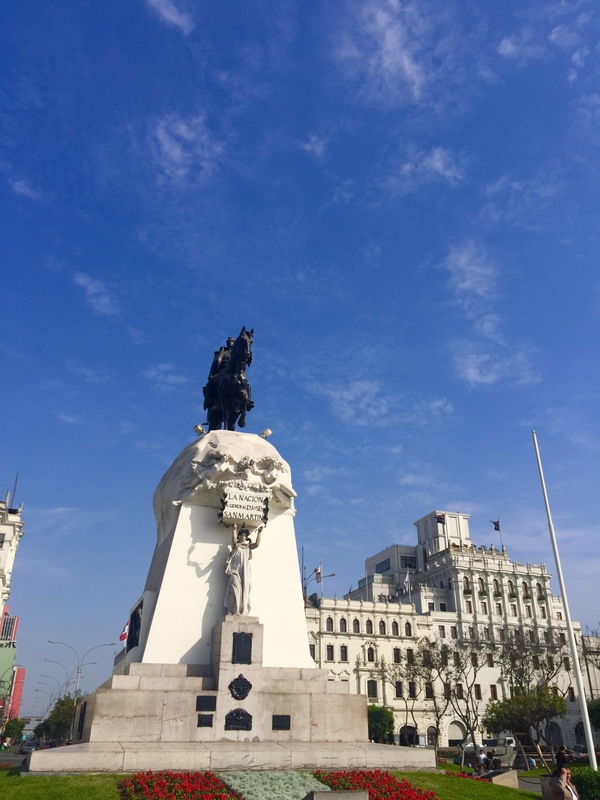 At 2 pm, we met up with our Lima guide who gave us a run down of the next couple of days. First and foremost, we have another early morning tomorrow am, with a hotel departure at 6 am to get to the airport for our transfer to Cusco. Oh well, I think my circadian rhythm is getting used to these early mornings! 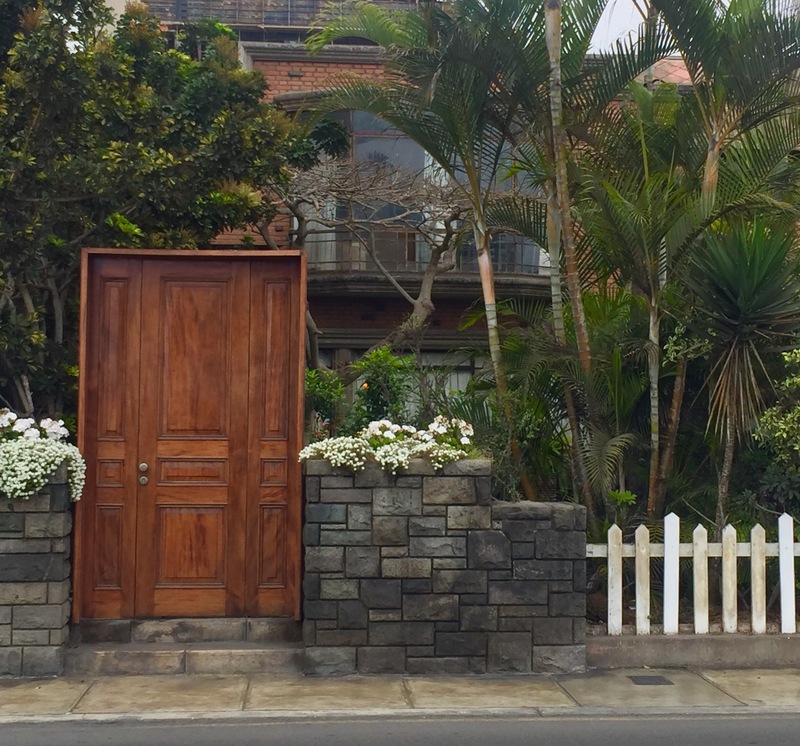 We chest walked down the streets of the old city and enjoyed the architecture of the “Belle Epoche” of the 1930’s as well as the gorgeous family homes of noblemen from the 17th century. Here’s one that has been converted into a Foreign Affairs office! The screened balconies at the time let the noble people see what was going on in the streets without being seen! 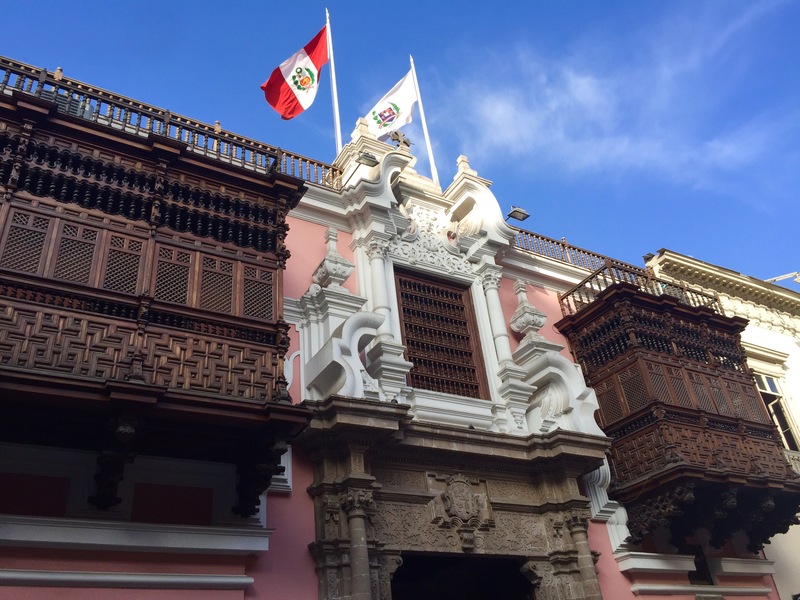 We visited the famous church, Our Lady of Mercy, built on the location that the first services were held in Lima. What I found fascinating was a silver cross in the church that was said to cover the remains of a monk. These remains are believed to have healing powers and for each miracle performed, a silver blessed heart has been placed as a thank you! Our tour ended up at around 5:30, and after a quick shop for fruit and water, and some Money conversion, we headed out to Tanta’s for supper. 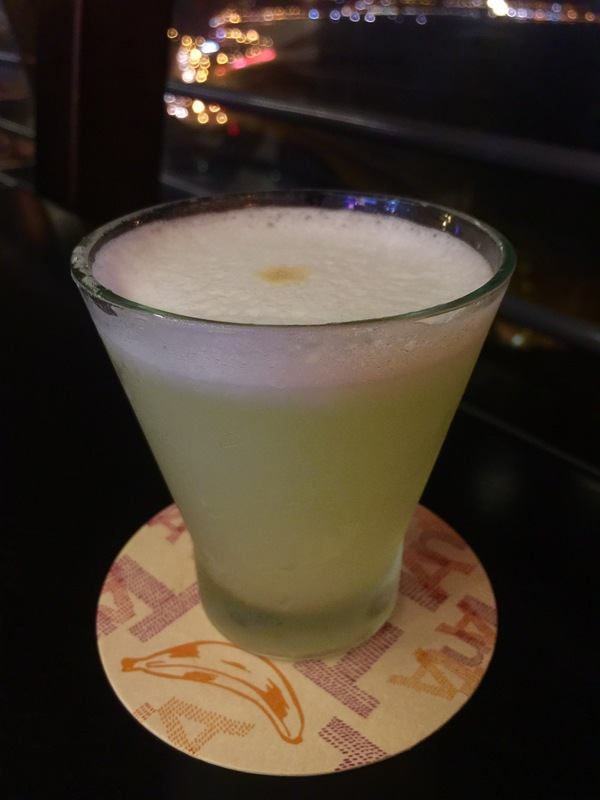 There I had the best Pisco Sour in the city…like drinking a sour version of a key lime pie! Yum! BTW the meals were excellent as well! 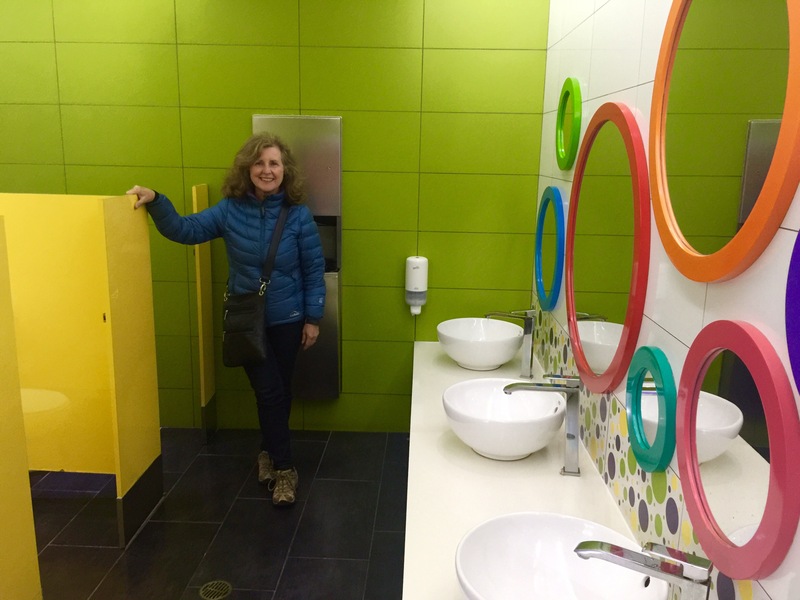 Leaving Tanta’s at Larcomar ( an upscale shopping mall built into the side of a sea cliff), Gwen and I made a rest stop and discovered that they actually have a washroom geared to children! Adria and Jen, this one’s for you! Well the night is coming to a close for me. 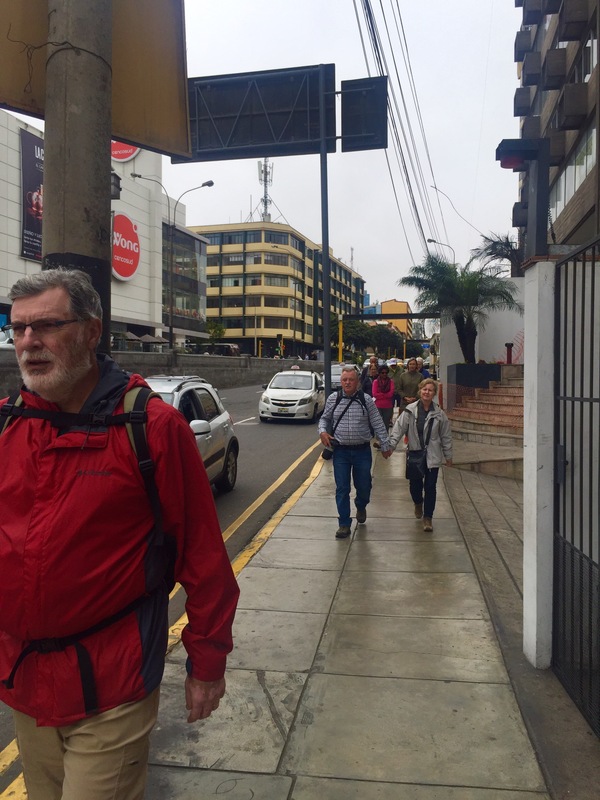 Tomorrow we are off to Cusco to spend a couple of days acclimatizing before our hike on the Inca Trail. Rest is in order! Until tomorrow my friends! You are going to need a holiday after this trip to get over it all! Happy Halloween. Happy Hallowe’en to you! No pumpkin carving for us this year! 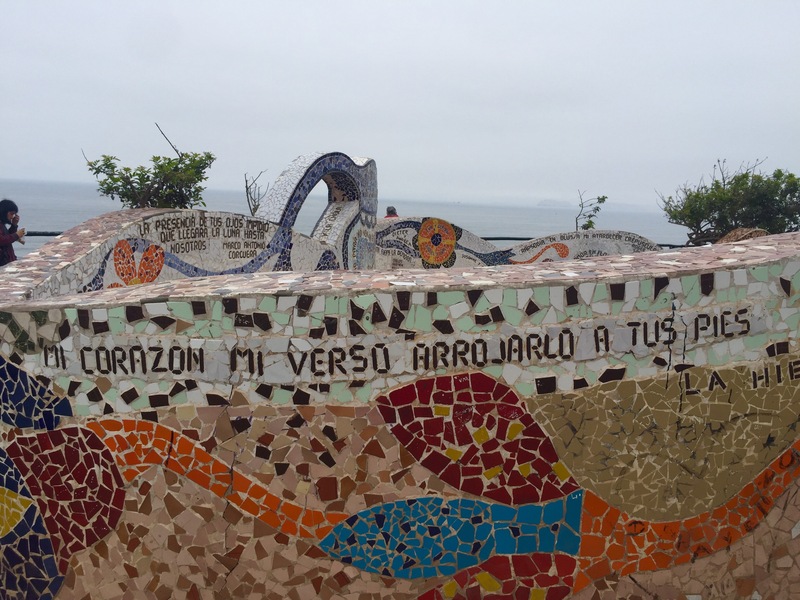 Beautiful love poems in the mosaic tiles! Is there a story behind this? Just a park for lovers! 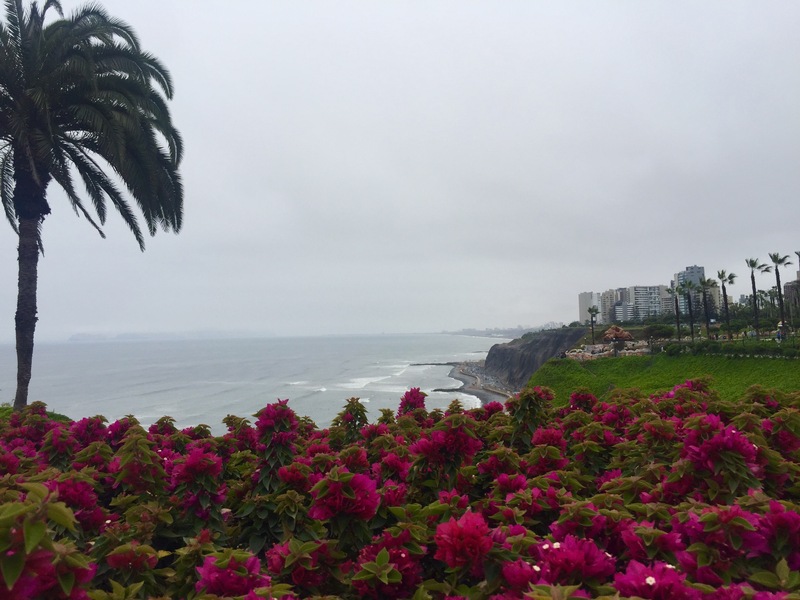 Heading back to Lima tonight…. will be happy to get back to sea level!! !